On Monday will be the final episode of “Boston Legal,” the David E. Kelley series that, among many other things, found a way to revive William Shatner in a way one previously would not have thought possible. 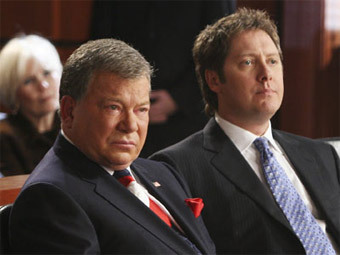 I must confess to having a soft spot for “Boston Legal,” despite its obvious flaws. It does what it sets out to do fairly well. And that seems to be, like “The Practice” before it, to provide a (liberal) soapbox for writer/creator David E. Kelley to preach from while showcasing its quirky cast of characters. I watched the first season and a half of “Boston Legal” before letting it fall by the wayside because of other viewing habits. But I picked it back up in January when I finally joined the DVR revolution. Indeed, this week perhaps topped all the series’ self-references with an episode where John Larroquette took a TV network to court for age discrimination for not having enough programming that appeals to the over-50 crowd — the demographic toward which “Boston Legal” itself skews and is reportedly the exact reason for its cancellation by ABC. Says Larroquette, citing examples in court: “Shows like Bo… I can’t say it; it would break the wall.” Heh. As if you hadn’t already. Somehow, as contrived as these references can be, I admire the cheerful spirit. And, of course, the show is grounded by a friendship that is enjoyable to watch — that of Alan Shore and Denny Crane. James Spader is very good as Alan Shore; through Kelley’s writing staff, Spader’s courtroom closing-argument scenes have showcased an unmatched verbal prowess and a relentless ability to persuade. Even as we know we’re being shamelessly manipulated by the plot and/or arguments, the ride is enjoyable. Certainly, I have my qualms with the show. It’s way too formulaic. The dialog can be too cute and aware of how funny it knows it is. The music hammers on the “Look how funny we are!” vibe with far too much insistence. The characters are, let’s face it, fairly one-dimensional. The show can be flat-out cartoonish at times, before pulling a 180 and becoming deadly serious. The political preaching can be predictable. But as a comfort entertainment with sharp writing, you could do far worse. Having seen probably a little less than half of “Boston Legal’s” episodes, I don’t feel like I missed a great deal, but I enjoyed it when I was watching. I am speaking for numerous amount of people, please, please, can we get boston legal to stay….I just got into the show this season due to fellow colleagues, who rant and rave about this show..I tried it, love it….hooked, how it is going off the air! My only gripe with ‘Boston Legal’ came from its string of Emmy nominations while my beloved, epic ‘The Wire’ got nothing. But I guess that’s misplaced blame. I wasn’t an avid watcher of the show but I enjoyed Shatner’s performance in it. And, in the early days, I got a kick out of “Kirk” and “Odo” being on the same series. Whatever happened to Rene Auberjonois’ character, anyway? I hope you take a look at The Shield’s finale down the line. I’d be interested to hear your thoughts on it. ^ I agree. You should definitely spend the energy writing an article about The Shield. In fact, it was your previous article on your Jammer’s Reviews site that got me hooked to begin with. Season 7 was amazing. Excellent finale. Yeah, it was his article that made me check the show out. I figured if he said it was excellent then I should check it out.